Let’s start here: If you’ve spent even a minuet studying photography then you doubtless have come across two – seemingly contradictory – ideas. One is that “your gear doesn’t matter” and the other is “use the right tool for the job”. On the one hand you’ve got the oft repeated ideal that a good photographer can take a good picture regardless of what gear they have. On the other, you don’t see a lots of Pros buying disposable point-and-shoots along with their Red Bull at the local Convince Store. The truth (with a lower case “t”) is this: There is a hell of a lot you can do with very little gear; but sometimes you’re just screwed if you only have is hammer and all you can do is look for nails. 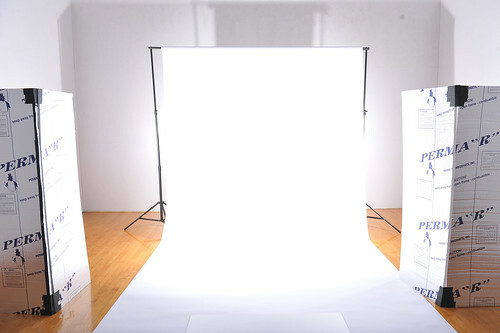 Up until recently my entire lighting inventory consisted of the following – one AlienBee 1600 and two Nikon SB800s. And that, my friends, is a three light setup. You can do a helluva lot with a rig like that, and it’s done Yeomen’s work for me. But, sadly, there have been times when that just wasn’t the right gear to do what I needed; and full body white seamless was one of them. (A quick aside): Yes, yes… you can shoot FBWS (full body, white seamless) with the gear I just described. Of course you can. I can take that picture, you can take that picture. But in this particular case the job called for shooting 14 subjects, each with 2 outfit changes. Let me jump to the end and say that I wound up shooting some 1300 frames over the course of the day. The SB800 is venerable to say the least… but, again, just not the right tool for this particular job. If I had used the SB800s as my background lights then between the recycle time and changing batteries every 15 minutes the shoot would have taken days. So can it be done? Yes. Is it the right way to do the job? Don’t think so. Aside #2: If you are wondering why I didn’t buy two AB800s or two Einstein’s… well, the latter would have been awesome but just too expensive. The 800s would have certainly done the job, but I was looking ahead to the summer – when I like to shoot outdoors against the sun – and that extra stop of light will come in very handy. Also, I hate math… and adjusting the ratios on identical flashes is much easier if they are, you know, identical. And, in the interest of full disclosure - for this particular gig I also ended up buying the following: A fresh 9 foot roll of white seamless, two 4 by 6’ sheets of white tile board (to pick up the reflection of the subjects), and two 4 by 8’ sheets of Styrofoam insulation (to be cut into flags for the background lights). That’s about another $150 out of pocket, but it’s all for things that I’ll be using again on future shoots. Finally; the shoot proper was going to take place at a nearby fitness club. I’ve shot there once before and knew that they had the obligatory Racket Ball courts. 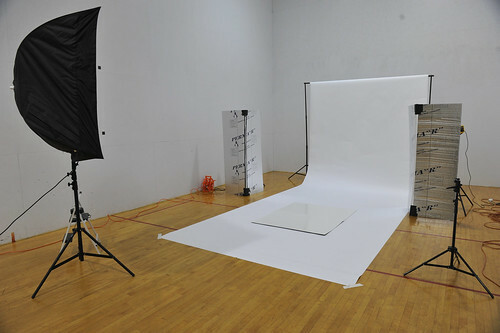 When the club was suggested as the venue, I immediately knew the courts would be the perfect “studio” for these shots. Perfect with the exception of shooting, literally, inside a fishbowl. But wadda you gonna do? Notes about this setup: I’ve got one AB1600 upfront in a Wescott Apollo 55” softbox and two more behind the flags. More importantly, everything (and I do mean everything) you see inside the court had to be packed into my Honda Fit. Here is a slightly less cluttered shot of the setup. A note about the flags: Zack recommends using Home Depot bi-fold doors, and I’m sure they are perfect for a studio setup. But they are also fairly heavy – and I had to load and unload all the gear myself. Styrofoam insulation (while not nearly as sturdy) was cheaper, did the job just as well, and was a heck of a lot easier on my back. This is a test shot with just the background lights at about 1/8th + 2/3rd. It’s pretty close but there are two important things that needed to be fixed. The first is that both the lights are spilling off the background paper and hitting the wall. This light (as well as the light from the background itself) was also skipping of the silver materiel on the Styrofoam flags. All of this meant that light from the background was spilling over and contaminating the subject. If you look at the picture at the top of this post, you’ll see exactly how much light was reflecting off and hitting the subjects. Re-aiming the lights and angling the flags minimized this a great deal. But it was that silver “stuff” that was causing me the most grief. Pulling it off wouldn’t have done much as the Styrofoam was white underneath. At the end of all my tweaking I was still losing some mid-tone contrast in my images. I hate thinking “well, I’ll just fix that in Photoshop”, but in this case it was a small and very easy adjustment to make. Notes about these pictures: All the post was done in Lightroom and consisted of (very minor) dogging of the edges to get them pure white, increasing the contrast & blacks, and some minor sharpening enhancement. So that’s my story. It was a very long day, ending with a paycheck that went fully and directly to paying off the gear that made it possible. Holy. Guacamole. You're so good. I quit. Done. Finito. Over and out. Except I'm inspired. But I'm also demoralized. I think I need an ibuprofen...after I look at those photos again!